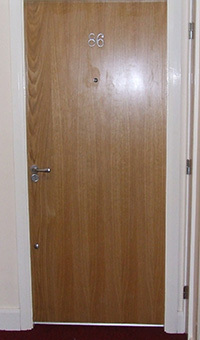 Nearly all Apartment Doors in Ireland are incapable of withstanding an aggressive attack by burglars. Why? Because the door and frame are made of timber and even when containing two locks provide little resistance to the intruder. This contrasts significantly with continental Europe where most EU member states insist on the use of security doors in conjunction with steel frames. 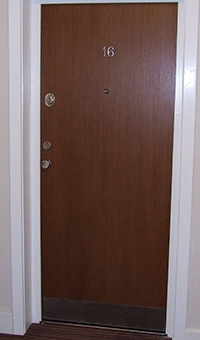 These doors while appearing identical to those used in Ireland are designed specifically to stop burglars in their tracks. 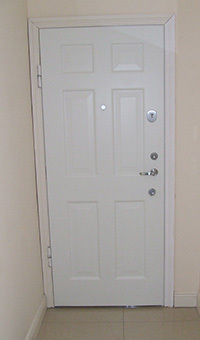 Apartment doors in Ireland must also be fire doors and the finish on the surface of the door and frame must conform in appearance to the remaining doors in the Apartment Complex. 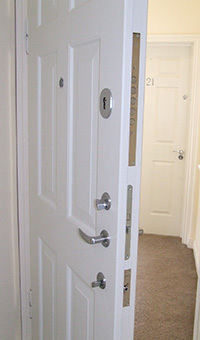 As Ireland’s leading installer of Apartment Security Doors we are here to provide the best advice and service.